One of my favorite little gems in Orange County is Balboa Island. We first went there right after we moved here four years ago, and we’ve been back a bunch of times since. It’s a tiny island that’s mostly residential, but it has a pretty little main street with shops and restaurants, a quick ferry that takes you over to Newport Beach, and just a really perfectly quaint vibe. The place we almost always have to stop is Sugar ‘n’ Spice — the Original Frozen Banana stand. They sell frozen bananas dipped in chocolate and toppings, but they also have delicious Balboa Bars, which is just an ice cream bar on a popsicle stick, also dipped in chocolate and toppings. Whenever we go to Balboa Island, a lot of walking is involved because we love to walk along the boardwalk and admire the gorgeous homes. So a good pair of walking shoes is a must. I’ve heard amazing things about Birkenstocks for basically my whole life, but somehow had never owned a pair. It turns out they live up to all the hype. Their soft soles and leather straps make them instantly feel like they’re broken in, and I love that they’re easy to slide in and out of. I ordered the narrow width and the regular width from Zappos, even though I don’t have particularly narrow feet, and I ended up keeping the narrow ones because they stayed on nicely and didn’t look bulky. 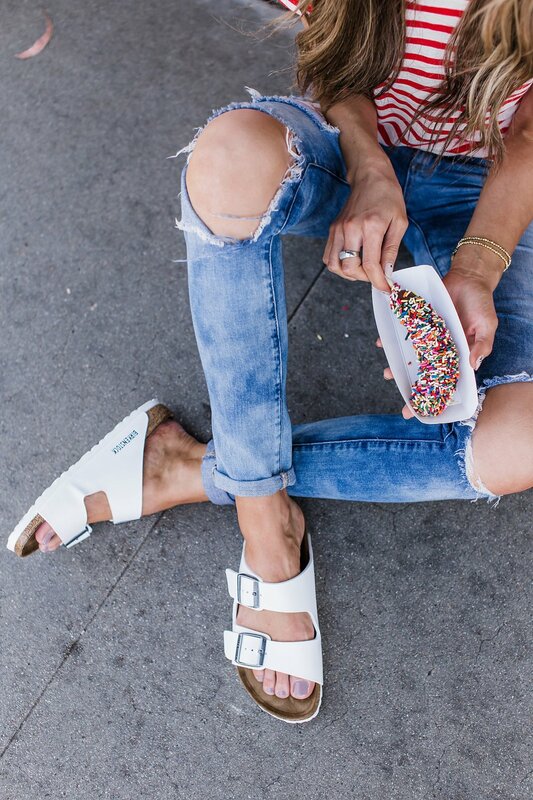 They’re perfect slides for throwing on with a dress or skirt too, but I paired these crisp, summery white ones with my favorite lightweight tee and some boyfriend jeans for a comfy day out. Super cute combo! Love your tee and sandals! Yes, go for the narrow! Those bananas sound so so good! 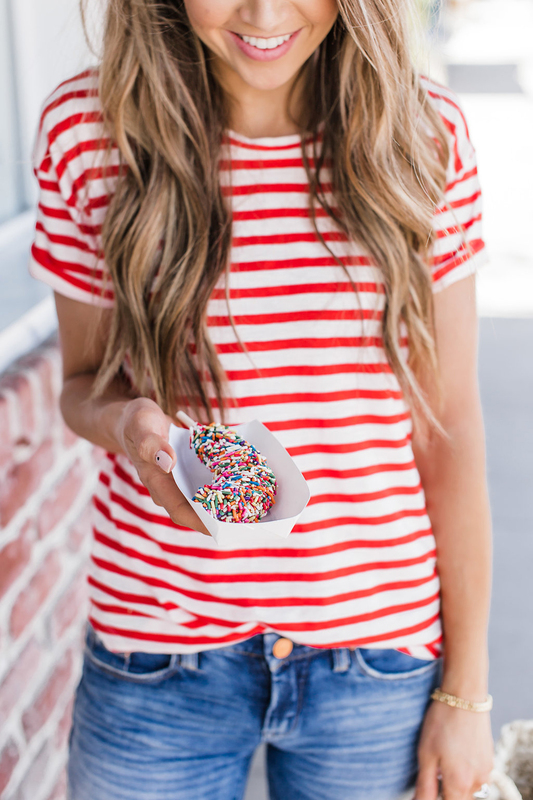 Love your summery red and white stripes too!